The New York Jets' new uniforms have taken flight. Gotham Green, Spotlight White and Stealth Black — the wraps are finally off and the new colors raised. 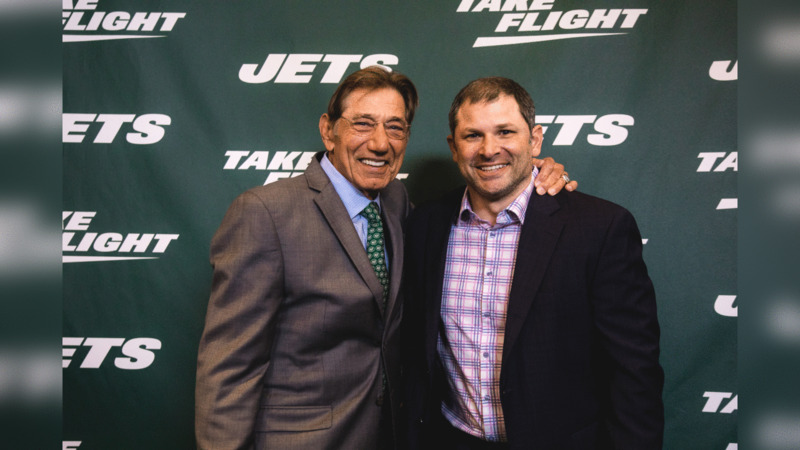 Before a crowd of 400-plus Jets fans and both local and national reporters at Gotham Hall in Manhattan, the Jets staged their long-anticipated uniform unveiling. The evening was emceed by actor/comedian/writer J.B. Smoove and was set to music by artist MAX performing his signature "Still New York." But the stars of the show were the Jets players — Sam Darnold, Robby Anderson, Quincy Enunwa and Chris Herndon for the offense, Leonard Williams, Avery Williamson and Jamal Adams for the D — modeling the different variations of the new uniform, which feature a new number/nameplate font and "Jet Edge" design elements, on the short Gotham catwalk that they will wear into battle for the 2019 season. How did the players feel about slipping into the new form-fitting threads for public consumption for the first time? Williamson, wearing the new black jersey and black pants: "We've been waiting all offseason for it. We knew they were going to be nice. I can't wait for this fall. Oh, yeah, we're excited to change this thing around. Jet up, baby." Anderson, in all white: "Man, I felt like new money. It felt great. I'm excited." Williams, in all black: "These all blacks, obviously, this new color wave is crazy. I'm proud to be the first one wearing it, and I'm happy for all my guys, too." Herndon, in white jersey and green pants: "For me, it was a shock. I opened the briefcase and I didn't have any words. I just stared at it and was like ohhh ..."
Enunwa, in all green: "New jerseys, new team, new coach — you've got to be excited." Adams, in all black: "It's a new era. The uniforms are beautiful. If you don't like 'em maybe you have to go grab a drink or something. These uniforms look damn good." Darnold, in green & white: "They look great, they look amazing. But for us it's about doing what we've got to do on the field first and then the uniforms will look good because we'll be winning games." The event was framed up by opening remarks from Jets owner Christopher Johnson and president Neil Glat, who were in the forefront of the process of working with the NFL and with Nike since 2014 to design these uniforms as one of the key pieces in the rebranding of the organization, the Atlantic Health Jets Training Center and MetLife Stadium. "Can you tell that I love this team? I love the hell out of this team," Johnson said. "This is not only a big moment for us but for our fans. When you see the new uniforms, you'll notice two words stitched across the chest — 'NEW YORK.' They represent the identity of the franchise moving forward: tough, hard-working, resilient, determined." "We are definitely delighted with the results," Glat said. "Our new uniforms are built to perform on the world's biggest stage and are designed to be both modern and innovative." "Black and green ones I will say look good for sure." "They are an absolute knockout." "Stealth black, I love it." As for the not-so-positive commenters, we think they'll come around when the Jets pour out some of that opinion elixir called winning that Darnold spoke of. And as Adams, a.k.a. @presidentmal, advised the assembled crowd in the Gotham and fans watching the show from home, "Kick back and relax, and come to training camp. It's going to be a good one."